If you like the idea of living in a city that welcomes you with refreshing greenery almost everywhere you go, Singapore may be the home that you have been looking for. In fact, it was given the title of a garden city because of its rich and lush greenery that was designed to merge with her concrete developments seamlessly. Apart from being just part of a designed landscape and playing a vital role of refreshing the air of Singapore, the plants that are found in Singapore do have some interesting facts and stories that may pique your interest. In fact, there are trails for you to check them out while you are here too. Read on to find out more! If you have seen portraits taken in the outdoors of Singapore, like pre-wedding shoots, it is very likely that the ordeal tree in Seletar Reservoir is in the series. The ordeal tree species is a rather common tree that is planted in Singapore. In fact, it was in the list of top thirty species of abundance in Singapore, in 2009. The tree got its name from being an ordeal of native Africa’s trials, whereby an accused would have to drink the poison (red sap) from the tree’s bark. If the accused survives, he would be set free and if otherwise, death from the poison as proof of guilt. 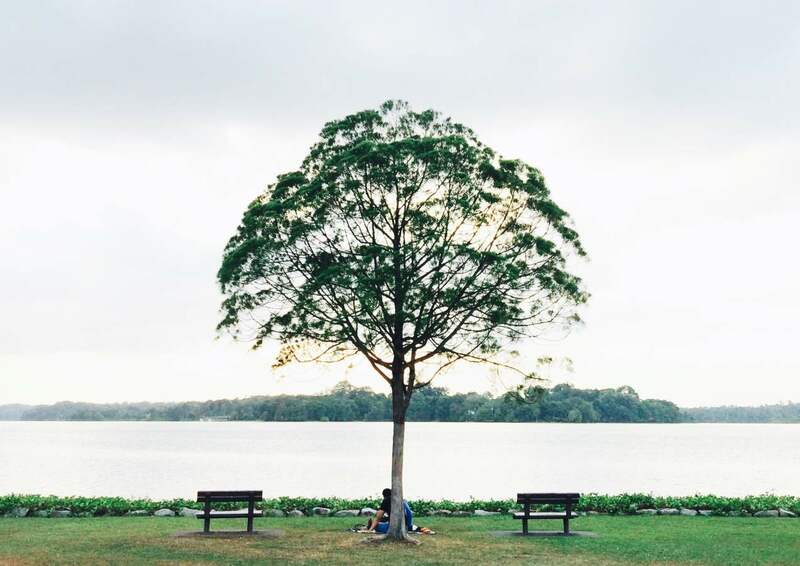 As of why the endorsed Heritage Tree in Seletar Reservoir is being ever so popular for photo shoots, it is purely due to its strategic location of looking gorgeous as a backdrop. Located along the shopping belt of Singapore (also Bukit Merah and central regions), Angsana trees are the ones with a weeping, drooping crown and yellow flowers. The flowers are faintly fragrant and would bloom and last for only a day. This deciduous tree can grow up to 40 meters tall and you may find one along Serangoon road, near Woodleigh Park. This specific tree is now maintained and endorsed as a Heritage Tree that is said to be more than 60 years old! There is also a cluster of 5 Angsana trees near the Lim Bo Seng Memorial, which were transplanted from Upper Serangoon Road in 2015. The original five were affected during the Angsana Wilt, an outbreak of disease that affects the Angsana species in the early 1990s. The reason for exactly five number of trees to take part in the replanting was an act to preserve the beautiful memory of the 1960s and 1980s, where the spot was a popular dating place for the locals. This beauty can be found in front of the National Museum of Singapore with its aerial roots dangling swaying in the breeze. This particular tree is also endorsed as a Heritage Tree like the Angsana Tree and is more than 60 years old. The Indian Rubber tree was an important crop for Singapore’s economy when latex as tapped to be processed into rubber. A beautiful tree that has its leaves growing in a straight row that resembles that of a fan, the traveller’s palm tree is pretty much an effortless element for tropical ambience. It is however not a palm but a close relative to the bird of paradise plants. It is said that the trees would align its photosynthetic fan in an east-west direction which allows travellers to use the trees as a compass, but more research has to be done to prove this fact. However, one thing’s for sure is that the sheaths of the leaves can actually hold up to one and a half litres of water and this was a valuable source of drinkable water to thirsty travellers and those that came to Singapore before it became a city, in the past. Spot this tree around Raffles Hotel when you are in town! Purported to be a symbol of love in many countries and given the name that translates to ‘longing beans’ from mandarin, the scarlet seeds of the deciduous saga tree have been collected in glass bottles by many to gift to their loved ones as an expression and pledge of their everlasting love. Saga refers to the word for ‘goldsmith’ in the Arabic language. In fact, saga seeds were commonly used in the past by the goldsmiths to measure the weight of gold and silver, hence its given name. If you would like to collect some for your loved ones, head on over to Ang Mo Kio Town Garden West or Singapore Botanic Gardens (near Lady on a Hammock sculpture) and pick them off the fallen pods. If you need to find a spot that is nearer to you, there are indications of where all the saga trees are located in Singapore when you search online. A common bush that can be seen along the sidewalks of Singapore that contains antiseptic properties. This plant is also used in weddings and funerals by the Peranakans and as a religious offering to the Hindu gods. The densely clustered flowers were a favourite of little children who would pick them and sip on the nectar like a sweet treat in the past. However, it is not advisable to do so any more as there may be a hazardous amount of insecticide and pesticides that have been sprayed on them. Sad to know that it has to be stopped but it is definitely an effective way to keep the plants safe from being over plucked and going bald!